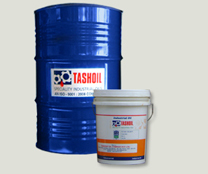 Compressor Oils- Spintash EP - 150 :: Tashoil Company Pvt. Ltd.
Spintash Oils are specially developed compressor oils to provide satisfactory lubrication under prolonged high temperature and load conditions. These oils are exceptionally stable and are fortified with antioxidant and antirust additives. A special polymeric additive incorporated in these oils reduces oil consumption. These oils are blended to meet the requirement of DIN 51506 VD-L group and ISO DIS 6521 specifications for air compressor oil. Spintash oils are excellent Cylinder lubricants for high performance reciprocating and rotary air compressors and can be used up to 220°C air discharge temperature.